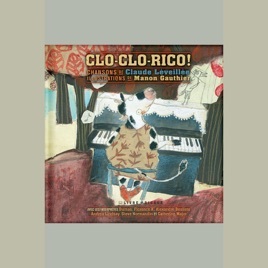 An homage to the beloved creator of Clo-Clo the Clown, Claude Léveillée, this anthology revisits his early days in television through children’s songs performed by contemporary young singers on the French and Canadian music scenes. The 14 songs in the storybook and give children a glimpse of animals they've surely never encountered before. Among them are Irma—the chicken who doesn't lay eggs—in “À la ferme de Grand-père” (On Grandpa's Farm), fleas that travel the world on every other animal's back in “Le choeur des puces” (The Flea Choir), and chickens that are fed up with hatching eggs and go on strike in “Les poules” (The Chickens).